The Enlightened Economist Prize 2017 – the winner! It has been a tough choice, as ever, to pick one winner out of the 14 titles on my longlist. It was a good year and all 14 are terrific books. After days of mulling it over, three contenders became clear. One was Robert Gordon’s The Rise and Fall of American Growth, because even though I disagree with parts of his analysis of today’s economy, it is a brilliant, magisterial work of economic history. All economists should read it. But Prof Gordon has won plenty of accolades for the book already and doesn’t need mine. I really enjoyed also Sam Bowles’s The Moral Economy, on the strengths but importantly the limits of economic analysis based on incentives as opposed to ‘moral sentiments’. However, the Enlightened Economist Prize winner for 2016 is a book that was enjoyable to read, informed me about all kinds of things I hadn’t known, and is full of insights about the relationship between money and politics, and the nature of property and value. It’s a great example of history helping one think more clearly about the present and maybe the near future. 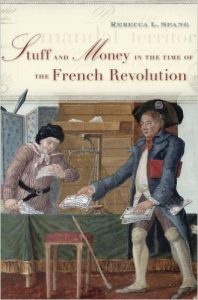 It is Rebecca Spang’s Stuff and Money in the Time of the French Revolution. Rebecca, if you read this, it means I owe you a nice lunch or dinner if we’re ever in the same place. This entry was posted in Main Page and tagged Enlightened Economist prize by Diane Coyle. Bookmark the permalink. I was a student of Sam Bowles (too many years ago). Of course, then he was on the radical fringe of the US academic economic community, but he did go on to help create one of the rare centers of leftist thought in the US then in Amherst, Massachusetts (of all places) — an interesting story in itself. It is such a pleasure to see him making important contributions to the social sciences/humanities and receive recognition. Anyway, having read Prof. Bowles new book, the Moral Economy (a book about the use and misuse of incentives), that was cited in your blog post I was amused to see a recent interview with Prof. Mankiw at Harvard on America’s PBS news hour in the US and in it the professor stated emphatically that economic begins with incentives . . . . The point was that it seemed that he could not envisage it be anything else but that entry point into the field. I see that Prof. Bowles still holds a position a bit on the outside of his discipline and is still not being understood at Harvard where he began his academic career.